Designed to work offshore in very deep water, the Seven Borealis, new flagship of Subsea 7, arrived in Rotterdam where it will be finished before being delivered to its owner. Built by the Sembawang shipyards in Singapore, the ship was originally commissioned by Nordic Heavy Lift Company, then was taken over by Subsea 7, which did change for the laying of pipes in deep waters. Adopting the SOC 5000 design developed by Ulstein Sea of ​​Solutions, Seven Borealis measuring 182.2 meters long and 46.2 meters wide. With six diesel engines Rolls-Royce B32: 40 V12A, the ship has an output of 5760 kW and can reach speeds of 12 knots. It also includes seven azimuth thrusters (5500 + 2500 kW, 3 front and 3 rear) and a tunnel thruster (stern) of 2,500 kilowatts provided by Rolls-Royce, including ensuring a dynamic propulsion Class 3 . 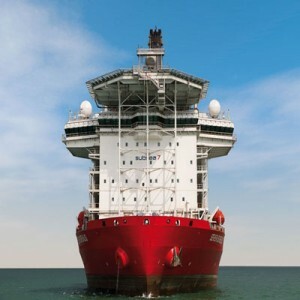 The Seven Borealis, which can perform work by 6000 meters deep, has an impressive crane with a capacity of 5000 tons. It also features a device pipelay systems with S-Lay Installation of 600 tonnes for pipes with a diameter of 46 inches, and J-Lay of 937 tonnes 24 inches pipes. Its storage capacity is 2800 tons carried. In addition, the Seven Borealis will implement tele-operated robots range workclass that might occur at 3000 m depth. We would add that the ship has a system for LARS type, provided with a system motion compensation sailors. With a platform for a helicopter-type S-92, Seven Borealis will seat 399 people on board.